Set Design for the theatre group Visual Respiration. Stand on the street is a play designed for an immersive experience of street food in India by Aruna Ganesh Ram, artistic director of Visual Respiration. Conceptually, the play is designed to heighten each of the senses touch-see-hear-smell-taste, to create a concentrated experience of street food and the stories around it. The challenge was to bring that experience in a 30ft x 30ft room. Further, the brief was to design a set that is also portable in its form and can be easily be set up anywhere. 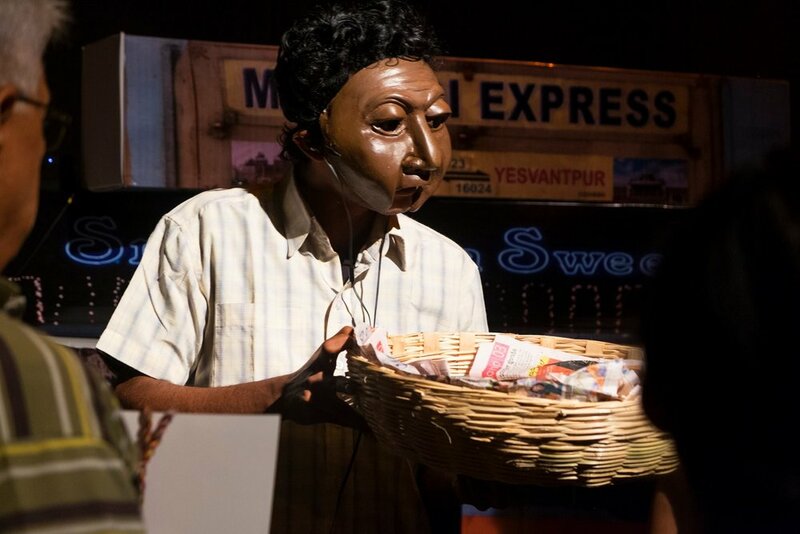 The team comprised of Anjana Balaji and Aditya Garg as the street vendors, Animesh Shrivastava for production support, Mt Aditya Srinivasan for aural landscapes. The acting, set, sound, production, all had to be in sync and respond to each other to create a cohesive sensorial experience of the street. Six different chaats of six flavours, from six different places India were being served as part of the performance. (The pungent yet delicious Jhalmuri from Kolkata, salt and spice of Litti Choka from Bihar, madhur vada savoury from Mysore, sweet bajra laddos from Karnataka, the bananas paan and more) The set design had to respond to each of these places and their streets. My idea was to make a flat pack set that fold into cubes of different sizes and have image collages of the visuals we find on the street, such as signages, posters, street walls, shops, etc. 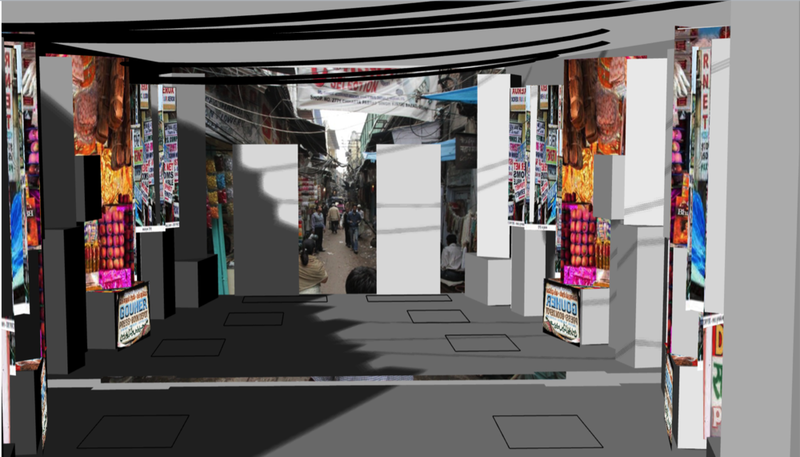 The visuals respond to the streets of these places creating dynamic backgrounds and environements for every stall. There were 70-80 boxes of different sizes were produced to create the environment in a 30ft x 30ft performance place. The boxes not only provided an overload of street visuals and edges through signages and disorienting angles, it also gave the effect of buildings and houses on the street through shadows. The essence was in these aesthetic details and effect, along with the frugal and functional aspect of portable set design that made the environment of the performance more convincing and real to a street. The show was premiered at Serendipity Arts Festival, Goa in 2017 and has travelled across states in India since. The portable set design has been used for over 64 shows and continues to be a part of this play. Thanks to Higrids Imaging for helping in production, thank you Zahoor Sultan for the box animation.